Automotive transmission ensures smooth shifting of gears in a vehicle for transferring torque generated by the engine to drive the vehicle. Mainly there are two main type of transmission manual transmission and automatic transmission. Manual transmission is a system in a vehicle that requires manual interference to shift the gear depending upon the situation. Automatic transmission is a system in a vehicle that changes gears at different speeds without a control driver. It provides enhanced driving experience and better fuel efficiency than manual transmission. Demand for electrification of vehicle systems is increasing due to new regulations by governments for emission control and reduced fuel consumption. Government regulatory agencies of developed countries are developing and implementing rigid regulatory frameworks regarding emission norms. Owing to all these factors, the global market for automotive transmission is likely to register a promising pace of expansion in the next few years. The market is expected to exhibit a 6.6% CAGR from 2017 to 2025, rising from a valuation of US$30.02 bn in 2016 to US$53.20 bn by 2025. In terms of transmission type, the automotive transmission market has been classified into manual transmission and automatic transmission. Over the years, manual transmission has been preferred owing to low cost and easy availability. However, consumer choices are rapidly transforming and automakers are increasingly switching towards automatic transmission. Automatic transmission provides better driving experience because of smooth shifting of gears and is highly fuel efficient than manual transmission. Increasing demand for electric vehicle is one of the major factor that would drive the automatic transmission system market in forecast period. Government initiatives for fuel efficiencies and safety attributes of the vehicle are encouraging manufacturers to implement such integrated systems that can ensure safety as well as comply with such regulations. Owing to these factors, the segment of automatic transmissions is expected to gain massive strides over the report’s forecast period. By vehicle type, the automotive transmission market has been segregated into passenger vehicle and commercial vehicle. The segment of commercial vehicles is further segmented in the report into light commercial vehicle, heavy commercial vehicle, and buses and coaches. In terms of revenue, the segment of passenger vehicle held clear dominance in the global market, constituting more than 64.3% of the market in 2016. The rising sales of passenger cars, especially across emerging economies are expected to help the segment retain dominance over the report’s forecast period as well. 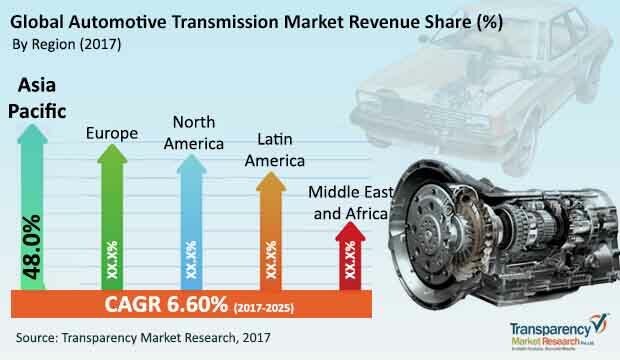 In terms of region, the global automotive transmission market has been segmented into North America, Europe, Asia Pacific, Middle East and Africa, and Latin America. In 2016, the market in Asia Pacific dominated the global market by accounting for nearly 48% of the overall market. The regional market will continue to lead to impressive growth opportunities for companies operating in the automotive transmission market owing to the massive rise in uptake of passenger as well as consumer vehicles. By the end of the report’s forecast period, the region is expected to witness a promising rise in its share in the global market, thus retaining its clear dominance. Key players operating in the global automotive transmission market are expected to benefit from the formation of strategic alliances with global players in the automotive Transmission market. Prominent players in the automotive Transmission market are Continental AG, ZF Friedrichshafen AG, Allison Transmission, Eaton Corporation, Borg Warner, Magana International Inc., Aisin Seiki, JATCO, Schaeffler AG, Hyundai Dymos, Bonfiglioli RIDUTTORI S.P.A., and Magneti Marelli S.p.A. The study provides a decisive view of the global automotive transmission market by segmenting it in terms of type, vehicle, and region. These segments have been analyzed based on present and future trends. Regional segmentation includes the current and forecast demand for automotive transmission in North America, Europe, Asia Pacific, Latin America, and Middle East & Africa. The report also covers demand for individual application segments in all the regions. The study includes profiles of major companies operating in the global automotive transmission market. Key players in the automotive transmission market include Continental AG, ZF Friedrichshafen AG, Allison Transmission, Eaton Corporation, Borg Warner, Magana International Inc., Aisin Seiki, JATCO, Schaeffler AG, Hyundai Dymos, BONFIGLIOLI RIDUTTORI S.P.A., and Magneti Marelli S.p.A and others. Market players have been profiled in terms of attributes such as company overview, financial overview, business strategies, recent developments, and SWOT analysis. The market for automotive transmission is primarily driven by rising demand for eco-friendly vehicles. The report provides the estimated market size of automotive transmission for 2016 and forecast for the next nine years. The global market size of automotive transmission has been provided in terms of revenue and volume. Market numbers have been estimated based on key type, vehicle, and regional segments of automotive transmission market. Market size and forecast for each major type and vehicle have been provided in terms of global and regional/country markets. Secondary research sources that are typically referred to include, but are not limited to company websites, annual reports, financial reports, broker reports, investor presentations, and SEC filings, internal and external proprietary databases, and relevant patent and regulatory databases, national government documents, statistical databases, and market reports, news articles, press releases, and webcasts specific to companies operating in the market, National government documents, statistical databases, and market reports, American Automobile Association, European Automobile Manufacturers Association, Automotive Research Association of India, Organization International des Constructeurs d'Automobile (OICA), Factiva, IHS, ACEA, CAAM, SIAM, etc.